Men's Shaving Gel lightly fragranced for sensitive skin. Softens facial hair while you shave, reducing discomfort coming from tug and pull. High levels of glide ingredients to deliver an incredibly smooth shave. 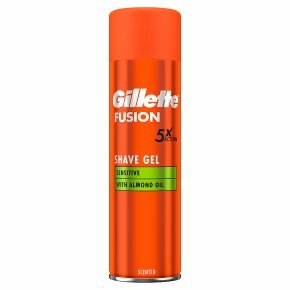 Dermatologically tested.Gillette Fusion Sensitive Skin Men's Shaving Gel with aloe gives you an incredibly smooth shave from start to finish with this specialized formula for sensitive skin. Pressurized container: May burst if heated. Keep away from heat, hot surfaces, sparks, open flames and other ignition sources. No Smoking. Do not pierce or burn, even after use. Protect from sunlight. Do not expose to temperatures exceeding 50°C/122°F. Keep out of reach of children. 5.1% by mass of the contents are flammable.